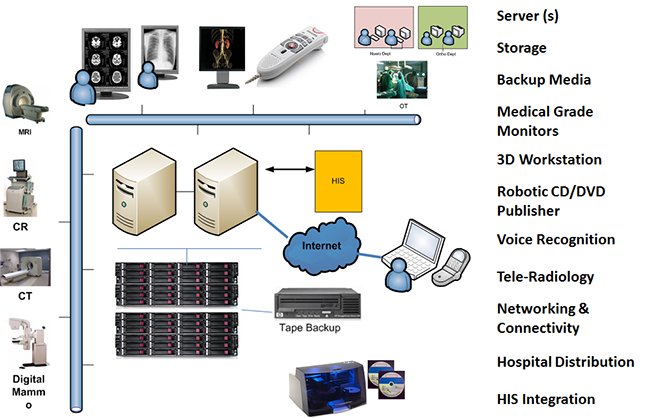 InstaRISPACS, a customizable WEB based RIS/PACS solution, is an archiving database server that stores high quality DICOM images and reports related to Radiology, Cardiology, Nuclear Medicine, Echo-Cardiology, Orthopedics, etc. It is a one-point source of information that is accessed by physicians over a local area network (LAN) and other specialists over the internet. InstaRISPACS is designed for single hospitals or medical centers. With InstaRISPACS, you are relieved of the costs of procuring and storing film archives. Film archives can get damaged or misplaced and retrieval can be time consuming. InstaRISPACS overcomes these challenges and increases the productivity of your hospital. InstaRISPACS saves time for patients, doctors, specialists, and the hospital staff. InstaRISPACS has a fault tolerant architecture to ensure services are not disrupted. The model of the solution is scalable and images and information of any number of cases can be stored. More users can be accommodated by adding hardware. InstaRISPACS uses database backup scripts for regular data backups and complete database backups ensuring data is always protected. InstaRISPACS supports two-level reporting workflow. A report is prepared by a junior doctor and reviewed by a senior specialist before sending it back to the remote centers. Doctors and specialists can collaborate in real time for better diagnosis. Salarpuria Palladium, 2nd & 3rd floor, #2021,100 Feet Road,HAL 2ndStage, Indira Nagar, Bengaluru, Karnataka 560008.